Purchasing used camera tripods is a great way to save money. However, before you spend your hard-earned dough for this popular photo accessory, there are some factors you should consider first. A camera tripod is a worthwhile investment that will last for decades provided you care for it properly. Unfortunately, well-manufactured tripods don't come cheap. Most professional grade tripods cost upwards of $400 and can skyrocket to more than $2,000. A tripod's hefty price tag is one reason some photographers opt to buy used versions. Photo field: It's important to consider what you will be using your tripod for. Make a list of the types of photography you engage in. By doing so, you will be able to compare tripod features according to how they will enhance your photo goals. 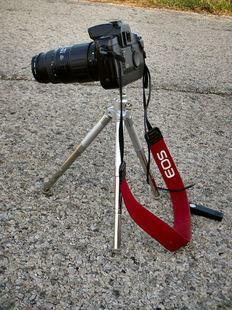 Material: Tripods are made from various materials, some more expensive than others. A tripod made from aluminum is going to cost more than one manufactured from traditional metal or wood, even if it has been used. Portability: Weight and minimum collapsed height are important if you plan to carry your tripod for long distances. The price of used tripods will vary according to their portability. Height: Before forking over cash on a used tripod, check its maximum height. Make sure the tripod extends far enough so that it provides comfortable viewing with your camera at eye level. You shouldn't have to extend the column fully to do so. Load rating: Pay close attention to the tripod's maximum load rating. An overloaded tripod will not perform well, so consider bringing your camera along when shopping for a used tripod. Column: Tripods with sliding, non-geared columns are less expensive and quicker to use with 35mm cameras and lighter medium format models. Conversely, geared columns are more expensive and heavier, but offer more control with larger cameras. When shopping for a used tripod, make sure it fits well with your existing camera. Legs: When purchasing a used camera tripod, it's extremely important to look for any leg damage. Also, be sure to examine the leg locks. Check for sand, dirt or other materials that could interfere with proper deployment. You should be able to take the legs apart easily and clean them. Flip-locks are more desirable to have since they are easier to use than locking rings, but the convenience will often drive up a tripod's price. While some photographers may be concerned with the condition of a used tripod's legs, the heart of the popular camera accessory is the head. Therefore, you should be more careful about inspecting the head than any other part of the tripod. Most photographers look for tripods that feature a ball head. A ball head allows a camera to "float" on top of a big ball bearing. A single control loosens and tightens the head in every direction. This is ideal for photographers who habitually re-position their cameras during photo shoots. In addition, serious photographers tend to use tripods with three-way heads, which provide three separate, screw-like controls to tighten each of the three X, Y, and Z axes. The advantage of having multiple heads is that it's easier to control your camera. The downside is that these types of tripods cost more. Used versions might run a bit less, but you will still be spending more on a tri-head tripod than one that features a single head. To get the best shot without wasting valuable time, look for a tripod that features a quick-release plate. The metal piece is basically a pad that screws into the bottom of the camera and stays there. Once the plate is connected, you can leave it there even when you aren't using the tripod. The plate allows you to secure your camera into place with a simple snap instead of having to fiddle with screws. A flick of your thumb on the quick-release lever releases the camera from the tripod when you're done taking your shot. To save even more money on a used tripod, you can buy a camera plate and attach it to your digital camera, instead of having to purchase it as part of an expensive tripod package. Used tripods are available at some photo shops, but are more prevalent at consignment stores and secondhand retailers. The Internet is also a stellar venue in which to shop for used tripods. Websites including eBay and OneCall.com offer a variety of previously owned tripods that are in excellent condition. However, the drawback to purchasing a used tripod online is that you don't get the chance to examine it firsthand. Ideally, you want to be able to test out a used tripod before purchasing it to ensure all of its features work properly and your camera fits well and moves comfortably on the tripod's head.